The Spatial Sciences Institute is a designated Esri Development Center (EDC), one of a small number of university entities which Esri recognizes as having exemplary programs focused on educating students in ways that promote the design and development of GIS applications using Esri’s web, mobile and desktop geospatial technologies. 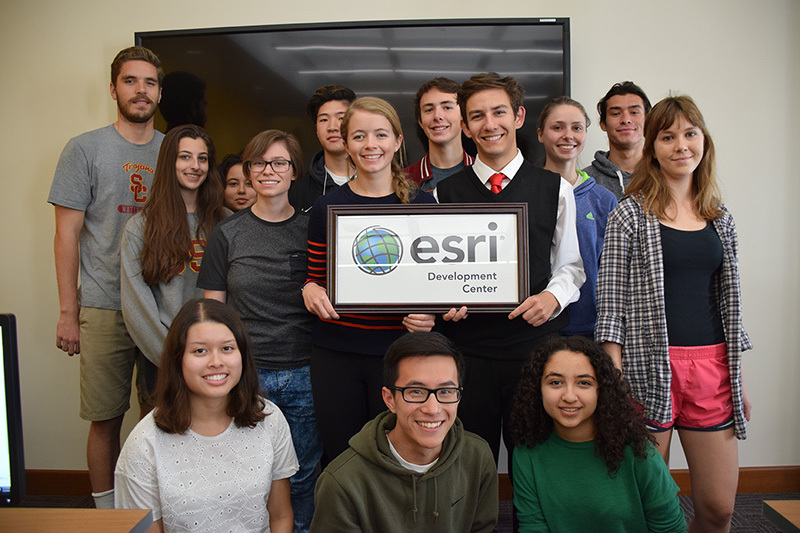 Students enrolled in any of the Spatial Sciences Institute undergraduate and graduate academic programs are afforded special access to Esri software, training and conferences, as well as special opportunities to be recognized for their accomplishments. As an EDC, the Spatial Sciences Institute organizes the USC EDC Student of the Year competition and participates in the Esri Developer Summit that is held in Palm Springs, California in March every year. The EDC Student of the Year competition is open to all students currently enrolled in one of the aforementioned academic programs and recognizes the exemplary contributions to the development of novel GIS-based tools, techniques, or models. To apply, please forward a 1,000-word extended abstract describing your project and the novel aspects that advance the design and development of applications using Esri’s web, mobile and desktop geospatial technologies to Dr. Jennifer Swift. A faculty committee reviews the abstracts and select one winner each year. The EDC Student of the Year Award includes a name plate on a perpetual plaque displayed in the Spatial Sciences Institute, small cash prize (currently $500) and the opportunity to make a presentation at the Esri Developer Summit. The USC awardee’s project also may be entered in the International EDC Student of the Year competition by the faculty evaluation committee. Those who apply must be currently enrolled in one of the aforementioned academic programs in the semester in which they apply or they must have completed one of these programs in either spring or fall semesters in the previous year (e.g., 2018 if applying to the 2019 EDC competition). The work must have been completed within the prior 12 months. Applicants must be able to provide copies of the final work product (GIS tools, software, models, multimedia, etc.) to the faculty evaluation committee upon request. Level of creativity and innovation. Novelty of the approach, design, or system. Potential for the project deliverables to help demonstrate and/or emphasize the efficacy of using GIS to solve real-world problems.